I have received an email reporting that the Park Service has finally succeeded in tearing down the Tennessee Historic Endangered List Wonderland Hotel in the Elkmont Campground of the Smoky Mountains. Does anyone have a report of this?? Has anyone been up there in the past few months? I read that they are taking the hotel apart by hand and warehousing all historic artifacts and shipping the rest out of the park. This is the first plan which also includes the removal of almost all the ghost town houses on Millionaires Row just above the hotel. Well i haven't been to TN, but I've heard of this hotel, and I hope it still stands. It's very sad to see our physical history lost forever. Laura, when you mentioned physical history, we had to put in our 2cents We too hate to see anything that is related to history buldozed, vandelized or faded away into oblivion or just plain "closed permently "for no apearent reason. We always thougt this is the land of milk, and honey. I guess not at any more. And we also wan't to add this. Refering to the term physical history, Just in the last few years we have seen another historical item, dissapear into history that has been around for over 150 years and thats the old everday camera that everyone had at arm reach to snapp the photo of something interesting that someone wanted to preserve and to look back on. in years to come, but now they will be lost in some electronic chip in someones box in the closet.or someones harddrive, and who knows maybe something else will come along that makes that electronic cip obsolete and the photos taking years ago are gone forever. I guess we are just old fashion we don't like all these new gagets Some things are a good thing, but why can't we keep some of the old gagets available for those who wan't them. Last edited by Johnnie; 05-26-2007 at 02:52 PM. You're right Johnnie & Sheila, Times they are a changin' for sure. I've still got my old 35mm camera but seldom use it anymore. The instant gratification of seeing my pictures right away on the computer and the savings on film processing keeps me using my digital camera over and over again. Hopefully, the pictures we're uploading to the internet will serve as an archives of sorts and be around for many years to come, I sure hope so. It does seem a shame that the "powers that be" can't see that each time they destroy another one of these historical sites, they're eradicating the physical history of our country. Our grandkids might be able to read about these places, but it's for sure, the way things are going, they'll never be able to visit them and see for themselves the actual sites where so much history was made. 'Tis a real shame. It's more important than ever for us to preserve the photos, books, written documentation and memorabilia we've all collected over the years to assure future generations will at least be able to see the photos and read about the wonderful things we've been fortunate enough to see in our travels. Thanks Laura, very well said. Yes! things are changing everyday and it is very hard to keep up with such a fast pace for us oldtimers, But as we all know progress, is a good thing and we welcome it, but in this race we are in 50th place, but we are rooting for the rest of you ghosttowners. Keep up the great work. Last edited by Johnnie; 05-27-2007 at 05:16 AM. I have been to Wonderland Motel. I drove past there last summer but did not stop. There are 100's of snakes there so it is best to go in cold weather when the snakes are not active. I was at Millionairs Row 1/4 mile away from the motel turn left at Elkmont Camp ground drive to the end of the road at the right of the parking area where it says, DO NOT ENTER Millionairs Row is straight ahead about 200 yards. 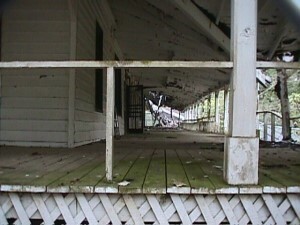 The plan originally was to restore Millionairs Row and make it available for people to spend the night in the old cabins but the park service could not get any money to pay for the project. For 10 years the project has been on hold. The cabins are used for storage they keep shovels, picks, axes, chain saws, rakes, lawn mowers, etc. in them. I live about 4 hour drive from there been there several times. I will never give up my Nikon K camera I just hope I can continue to get the film developed and continue to buy film. Another thing that is dissapearing is the old style TV sets. Everything is going to HDTV. Even the new TV's that are not HDTV do not have preamp tuners any more. The manufactures naturally assume everyone has cable or satallet TV so there is NO need for a preamp tuner. If you connect a TV antenna to a new TV it will receive nothing but snow. I have been buying up old TV's and old VHS VCR's at yard sales for a few dollars each. Federal law says all TV stations are suppose to be completely switched over to HDTV in 5 years. The days of free TV received from an antenna is almost over. I had cable and satellite TV once canceled them both. DirecTV ripped me off after I cancelled I got charged for another months of service. I refused to pay and was turned over to a collection agency. I later found out that several people from work and several people at church had the same experience with DirecTV and got charged for a month of service after they cancelled and were all turned over to a collection agency when they refused to pay. It makes me mad to pay $65.00 a month to watch advertisements on pay TV. The TV shows are the same shows over and over and over and over for years. Even thought there are a lot of stations I can not find anything to watch because I have seen it more than once already. Its funny Canada use to tell the pay satellite TV people, if your signals come down on our property then you are trespassing and we have the right to descrambler the signals and watch free TV and if you don't like it then get your TV signals off our property. Satellite TV systems were not sold in Canada as revenge to that attitude. For years you could not buy satellite TV systems in Canada not sure if that has changed now or what? Last edited by Gary Weaver; 05-29-2007 at 02:18 PM. few pictures of where the Wonderland Hotel once stood. enclosed) Also a few pictures of the Annex. My Uncle Lem owned the land that Wonderland was built on ..did you hike thru the smokeys before wonderland was built ? ever run into an old blind man named Lem who was a Bee Charmer and sold honey to passer byers ? I went to Elkmont quite a few years ago with an old college and recently have had the desire to go back up there. I am from Chattanooga, TN and know Gatlinburg pretty well but I have not been able to get directions from Chattanooga to Elkmont. I am not really sure where it is. Could anyone help?